Some of the most powerful tools for software developers are now free--a fact which Chris McMahon believes should help bring small businesses and local developers together in the creation of custom software. Read of how he plans to accomplish this on a local level. A tester can use a Web browser all day to conduct functional testing, but a browser won’t provide much detail or insight on its own. Learn how to improve your functional Web-testing capabilities on a budget with thes $60 Web-Testing Toolbox. Test managers are in the precarious position of being responsible to both the project and the team, but the manager and team know best whether overtime will help or hinder project progress. In this installment of "Management Chronicles," a test manager keeps the concerns of her team in mind when evaluating the need for overtime. Function testing is easy, according to Michael Bolton, and domain testing is only a little harder--but there are catches. In this column, he offers some tips to help you keep the risks of domain testing under control. Twenty years ago, Brian Marick defined a small startup's company process and coding standard in his position as head of quality assurance--and didn't win any popularity points. Looking back, Brian thinks that he and others in charge of process would be more successful using persuasion than using commands. In 1994, Karl Wiegers published a popular article titled Creating a Software Engineering Culture. More than a decade later, he reviews his fourteen principles on software development to see how they've stood the test of time. The flow of knowledge is more than mental. Better your team and improve your output through an adjustment in physical surroundings. Jean Tabaka describes the Japanese philosophy of "ba" and what it can mean to you and your development team. When you’ve got more tests than time, you prioritize based on risks. But risk-based testing has risks of its own. 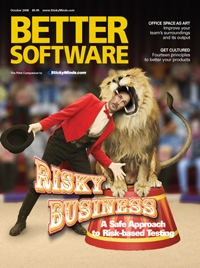 Randall Rice offers some advice on balancing risks with contingencies to take some of the bite out of risk-based testing. After years of searching for and being disappointed by database tools, Tod Golding found a solution when he wasn't looking. Microsoft's Language Integrated Query (LINQ) provides a dynamic bridge for the gap between developer and database.